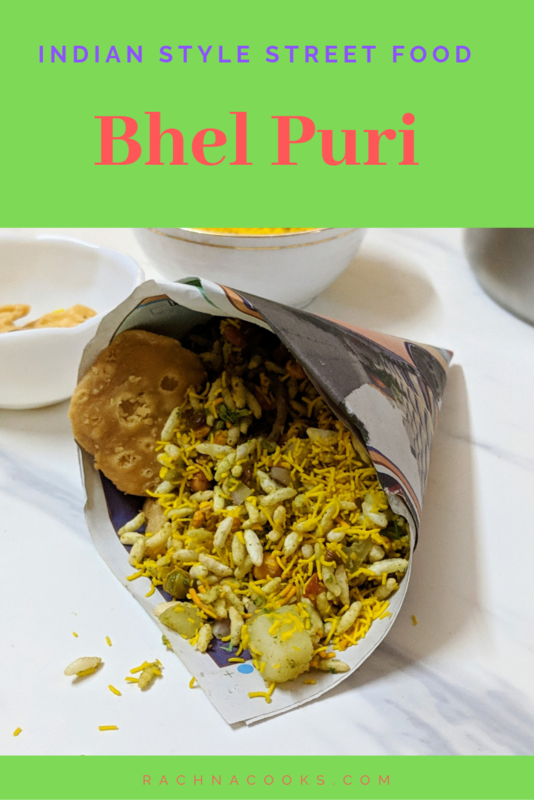 Bhel puri is a delightful street food from India which is popular everywhere. While the general recipe remains the same, it is highly versatile and can be modified as per your taste and liking. 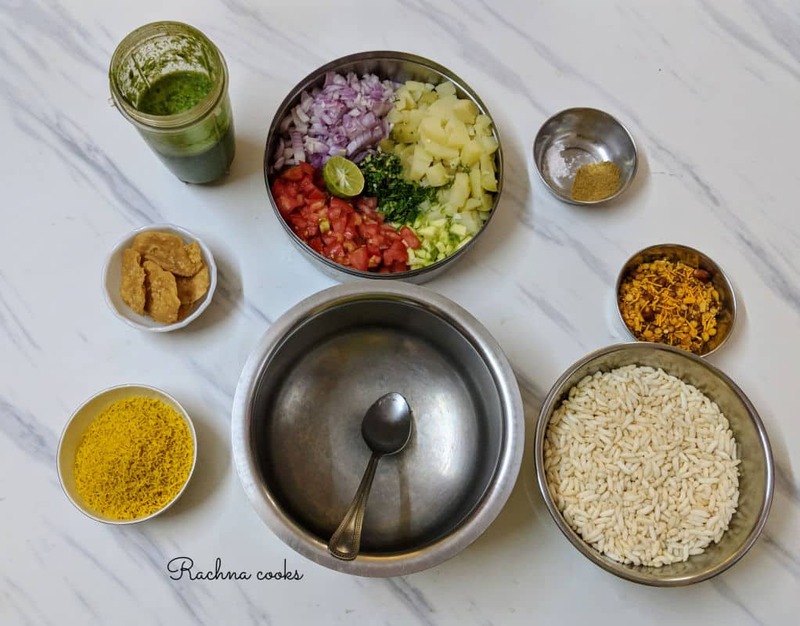 Bhel puri recipe is all about balance. It is sour, salty, slightly sweet and spicy. And it is this melee of flavours that gets your tastebuds in a tizzy. It is a perfect anytime snack as it is very healthy. It is also very flavourful. I make it as an evening snack along with chai often. 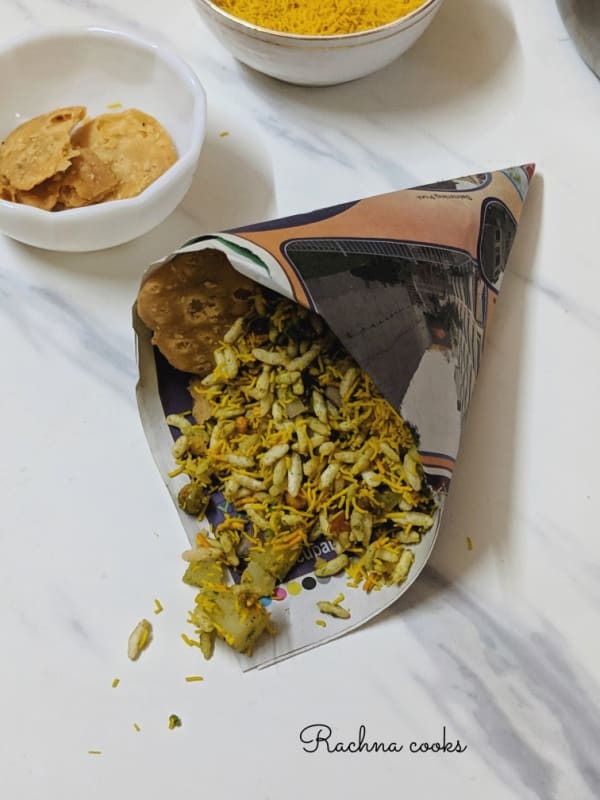 This is a step-by-step recipe of Mumbai style delicious street food bhel puri that doubles up as a perfect healthy snack. Do try the recipe. Mix together Puffed rice and namkeen and keep aside. Take in a bowl and add the chutneys as per taste. Add all the veggies, spices and lemon juice and mix quickly. Serve immediately garnished with thin or nylon sev and papdi. Your bhel puri is ready to serve. I don’t like sweet chutney so I use only the spicy green chutney in my bhel puri. You can also use grated carrot if you like but I like this combination of veggies. Make sure you serve immediately or your puffed rice will get soggy. You can’t make bhel puri and store it. You have to make it and serve instantly. Adjust spice according to taste. This is a quick and easy recipe and healthy too. You can have it guiltfree any time as snack. 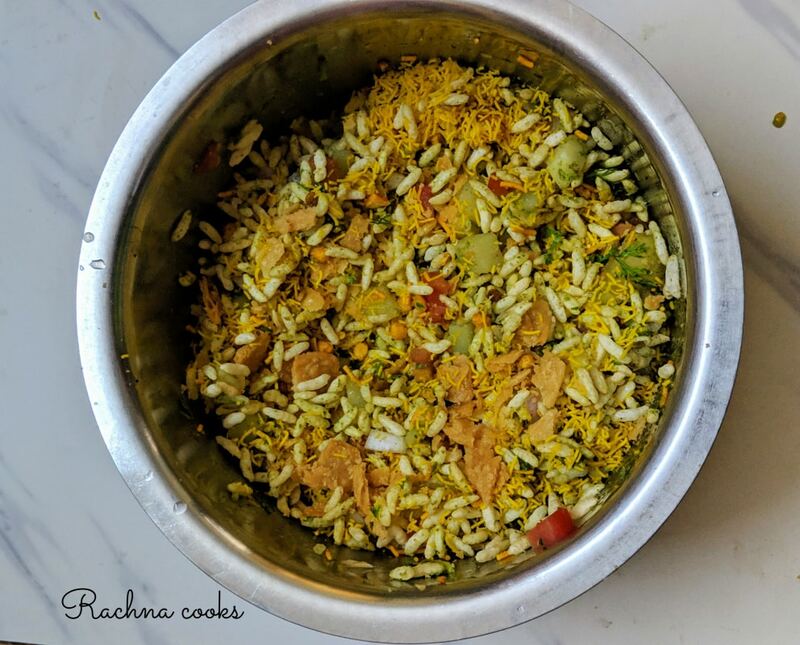 In a mixing bowl add together puffed rice, mixture, chopped veggies, chutneys, spices and mix together. Top with fine sev and papdi along with lemon juice and serve instantly. 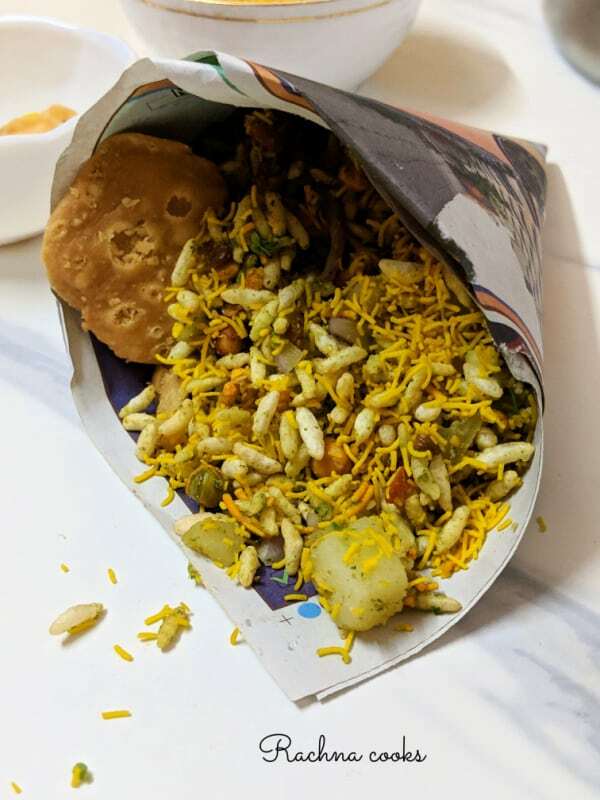 There is also a dry bhel puri that is often made and eaten. The only difference is that all the above ingredients are used in the dry bhel except wet chutneys. The flavour comes from lime juice and spice mixes. You can add more chopped green chillies or red chilli powder if you want it hotter. This one does not get soggy easily and it is easier to make it quickly. Some people add things like boiled chickpeas to this. Hope you liked these bhel puri recipes and will make it in a hygienic way at home. Enjoy this popular streetside snack at home. Do try out these other chaats: pani puri, dahi vada. 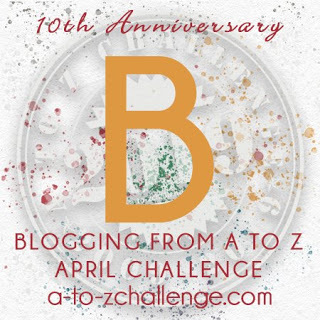 Check out the other posts in A to Z challenge 2019 here. This is a part of A to Z challenge this April. 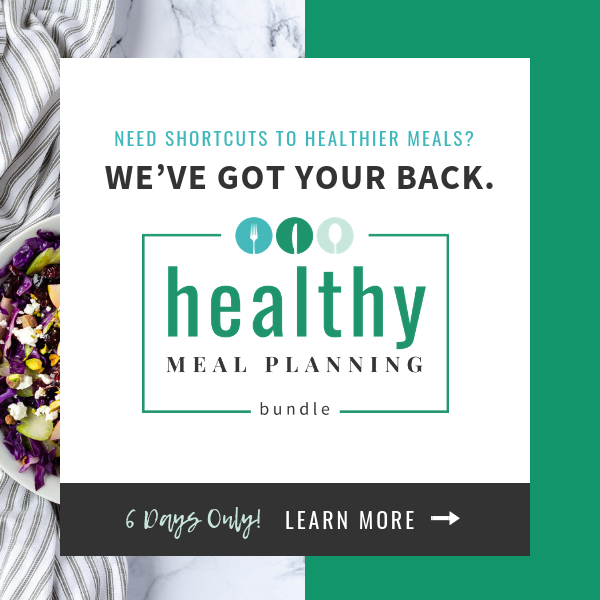 I am sharing easy recipes, food tips and tricks all this month. Do follow along. I have to only organise the papadi and the sev and I shall be able to make it. We all LOVE bhel. That’s one of the few things the husband enjoys making but he has some other recipe that uses mustard oil and of course he splatters the kitchen with the Murmura! That’s a devil to clean up. 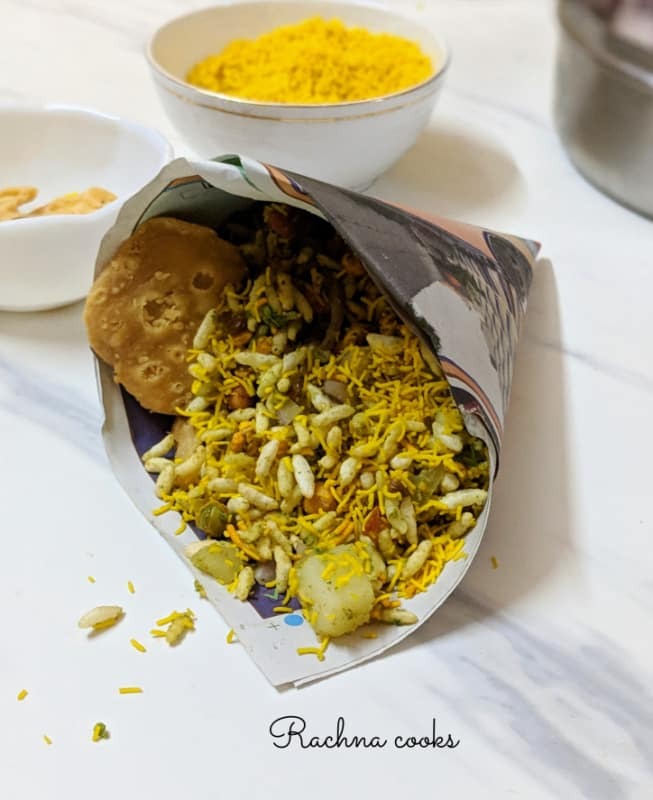 I love home made chaats and this one seems so easy! It looks so delicious as well. Super easy and a favourite snack at my place in the evenings. You just need to have the ingredients in place. Many times we don’t have sev or paapri and we just leave it out. Pinned the post! It is my fav! I love Bhel Puri. Infact it is one of the rare things that I love making for myself and the kid. This is definitely going to be my snacks today evening. Bhel puri is anytime food. I simply love it! We usually don’t have imli chutney or hari chutney at home. So we add mustard oil instead. It’s pungent flavour and sharp aroma lends a different kind of twist. 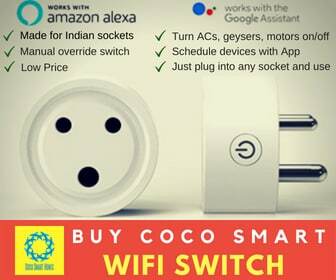 Do try it sometime if you haven’t. I love bhelpuri and make it pretty often at home. This is my go-to snack when there’s paucity of time and the in-between meals hunger pangs are strong!! Nothing like home made food! This Bhel looks so delicious! Mum makes it at home from scratch too, in a similiar way. It took me back to my hostel days when my roommate used to prepare bhe puril at night during exam days for us. Thanks for the recipe. You’re welcome, Neha 😊 Thanks for dropping by.